It is 1885 the famous impressionist painter, Claude Monet, settles in on an isolated beach to begin another day of open air painting. With single-minded focus, Monet becomes so absorbed in his work, that he doesn’t feel the wind kicking up the sand, he doesn’t see the tide coming closer, and he definitely doesn’t notice the big wave towering over his head. Until it is too late. 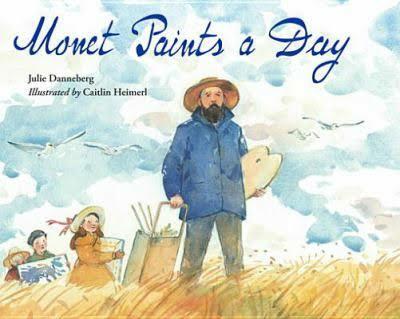 In addition to the lyrical narrative that reveals Monet’s passion and focus, there are also sidebars scattered throughout the text that give the young reader insight into Monet’s life. Back matter includes additional information about impressionism as a whole.